If you´re looking for things to do in Cozumel well then get ready for Cozumel's most thrilling experience, a world famous jet boat ride. It is a breathtaking ride from the moment your captain steps on the accelerator, zooming through the turquoise Caribbean waters at speeds of 45mph for an unforgettable adrenaline rush. 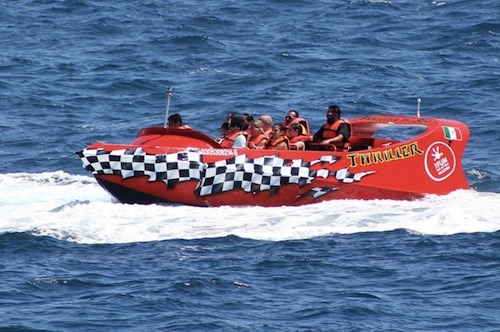 This exhilarating ride starts as you board the 700HP powered jet boat that seats 12. While you buckle up, your captain will brief you on safety guidelines and hand signals for the upcoming action-packed journey. Once away from shore the fun starts! Make sure to hold on tight when your captain makes the signal for a 360° spin, when the jet boat quickly turns in a circle without losing momentum. As you speed along Cozumel's pristine waters, nourish your brain and heart with a healthy natural high that will make you feel great! As the ride continues, the jet boat will stop at full speed, having the entire boat nosedive into the clear, refreshing ocean before heading back to shore. With all the tours there are some that are just above the rest and enjoying the Caribbean waters in thrilling fashion on the Thriller set it apart from the rest. Please note: The jet boat ride is not for the faint of heart. The ride does not involve driving close or making contact with any sort of solid object to intensify the thrill. The entire ride is in open waters in a boat made specifically for cruising, and it will steer clear of other objects. Passengers who are pregnant or who suffer from the following CANNOT participate: heart conditions, back, neck problems, epilepsy, any breathing conditions. Passengers must be at least 8 years of age. The jet boat ride is not for the faint of heart. The ride does not involve driving close or making contact with any sort of solid objects to intensify the thrill. The entire ride is in open waters in a boat made specifically for cruising, and it will steer clear of other objects. Passengers who are pregnant or who suffer from the following cannot participate: heart conditions, back, neck problems, epilepsy, any breathing conditions. Passengers must be at least 8 years of age. The specific meeting location at the pier will be listed in your confirmation email and voucher for this shore excursion. See the 'Redemption and Voucher Details' section below.